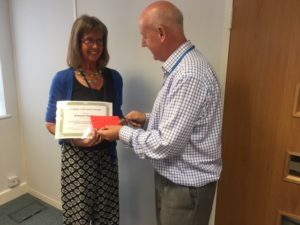 Residents, staff and visitors of Mother Redcaps Care Home have been nominating those who they believe should be awarded the 2018 Care Award and the winner was Debby – Home Administrator. “Debby has been the mainstay at Mother Redcaps for over eight years. She has seen managers come and go, but is passionate about her role and loves working at Mother Redcaps. She told me that this is her dream job! She is the meet and greet and go to person at the home. She never moans and just gets on with her job. Documentation is completed on time, and reports are always submitted in a timely manner, she meets all deadlines. As well as winning the care home award, Debby was also awarded with the CUMBRIC CARE GROUP ANNUAL AWARD. This award was decided by the three Directors following a review of the seven individual home winners and the comments they received. It was felt that over the years, Debby has excelled her self within her role whilst placing the Residents at the heart of all she does.